You know that Turkish cuisine is renowned. Most likely, that has a lot to do with your choice to come to Istanbul in the first place. Maybe you sampled a döner or two while travelling Europe, or maybe you’ve even spent your allowance on a pack of cow stomach to make yourself some homemade İşkembe çorbası. Whatever the case, you’re probably familiar with the basics of Turkish culinary life, so this page will simply give you a run-down of some of our favourite options for food, drink, and music around Istanbul and Galata. Simit – Known by Canadians as “sort of a bagel,” it is actually a toasted bread ring baked with molasses and decorated with sesame seeds. They cost one lira or so and seem to have a mesmerizing effect on everyone who sees them, because they are ubiquitous and strangely captivating to look at. They are sold alongside other baked goods on red trollies, are traditionally carried around on platters atop a merchant’s head, and make for a supreme breakfast, lunch, or snack. Kebap – It’s Kebab with a p. Various meats grilled on a spit, and perhaps even more ubiquitous and mesmerizing than the simit. It is served in an infinite number of ways, so you have to find your own preference. Can be wrapped in various types of breads, as you probably know, but also served in a spectrum of establishments, from street-side stands, to hole-in-the-wall back-alley affairs, to jazz clubs, to chandelier-decorated fine dining eateries. Döner – The name for sliced kebap meat served in a pita. Dürüm – Technically, the name of the pita that a döner is served in. Kokoreç – It is like kebap except it contains lamb and goat intestines instead of standard meat. Because otherwise, what happens to all the lamb and goat intestines? You’ll know it because it rotates horizontally instead of vertically. Usually great measures are taken to insure the meal is clean and well-prepared, and it is actually extremely popular all throughout Istanbul. You can find a few places right on Istiklal that serve it. Balık ekmek – Fish sandwiches. They are one of the foods people would rarely eat or think of eating at home, but suddenly go wild over when they see them here. It has something to do, certainly, with the fantastic seafood culture of Istanbul and Galata in particular. If you are craving something fishy, then take a walk by the docks and you won’t miss it. The fish market off Istiklal is also a good place to stroll through. Islak Burger – It means “wet burger,” which sounds off putting in English, and probably explains why they leave it untranslated. Put all preconceptions aside, and consider that it is actually very popular, especially around Taksim. It’s commonly consumed whilst drunk, obviously, but also by people looking to loosen their belt for a little savoury, garlicky, tomatoey snack. Köfte – Meatballs, essentially. Or minced meat patted back together. “Köfte” derives from the old Persian word for “mashed.” This is commonly skewered like a kebap and called “Köfte kebap.” As you can assume, there are endless variations. Dolma – The closest friend a peckish, fried food-craving vegetarian can have. Dolma is friend vegetables. Basically, it is various vegetables that are hollowed out and stuffed with other vegetables and rice. Common ingredients are eggplant, zucchini, tomato, onion, and garlic. Çorba – The simple answer is that this is soup. But more interestingly, it’s soup with a vast history and cultural value in Turkey. Eaten since times immemorial, çorba had ritualistic importance for the janissaries, was used by Ottoman aristocrats to cure hangovers, and more. There are a million varieties, of course. Baklava – A flaky layered pastry chocked with crushed nuts and syrup that has been clogging arteries and inducing regrets since at least the 15th century. In fact, they used to prepare large batches of this stuff in the kitchens of Topkapi Palace. Now it is the most prevalent dessert in Istanbul, and often arranged into amazing shapes, colours and sizes, and sometimes built into pyramids that arguably attract more attention from sweet-toothed pedestrians than those in Egypt. Tarlabaşi Sunday market – Just a short hop from World House Hostel, every Sunday you can find this market. Widely known as the cheapest (that is, most economical) organic market in Istanbul, the Tarlabaşi market is also the most adventurous. Tarlabaşi – a neighbourhood notorious 6 days of the week for its poverty, hard-nail lifestyles and incomprehensible streets – suddenly becomes one of the most happening streets in Beyoglu. Season produce fills the stalls in abundance; ornate arrangements of colourful of fruits and vegetables tower over the walkways; everything from shoes to staplers to pickles to hand-painted pots can be purchased en masse. If a wholesome Sunday brunch gets your imagination racing, don’t forget the off-the-map area of Tarlabaşi just a few minutes off Istiklal Avenue. 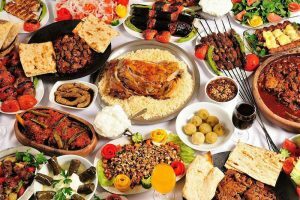 Meze buffets/ Meyhanes – Mezes are phenomenal and simple. They are essentially small, one-portion dishes served in a cantina style restaurant called Meyhane: something like Spanish tapas or Swedish smörgåsbords. Walk in, grab a tray, and let your eyes feast upon the possibilities: worlds of vegetables, meat dishes, soups, breads, desserts…All the classic Turkish dishes can be found in well-stocked places, and there is no shortage of things for the vegetarians amongst you. Plus, you can pay as little or as much as you’d like depending on your appetite. Just be venturous – if you don’t know what something is, try it! Everyone’s got their favourite Meyhane, but some good nearby ones are —–, and the quaint, unassuming Asmalı Cavit. Simit Café – If you’re looking for a very modern Turkish breakfast just a quick jaunt away from then hostel, then consider this place right off Tünel Square. A trendy place often brimming with young people and professionals, this place might be described as a Western-styled café with definite Turkish undertones. The breakfast is a standard one for working Turks: simits and other pastries, jam and honey, assorted vegetables, tea, and coffee. No room for complaint! Mekan – Several World House guests have raved about this place in the past. It’s a quiet place, not far from here and perfectly just off the bustle of Istiklal. Also, a place for the worldly curious and gastronomically curious: it professes a fine mix of Armenian, Jewish and Turkish traditional cuisines. Günay – Pleasant restaurant right in front of the Galata tower. Unbeatable location, of course! But importantly, Günay also has a great, elegant vibe that thrives on such prime real estate. People constantly walk out chirping about the pizza, the traditional Turkish dishes, çorbas, or mezes. Maybe a bit pricy for some backpackers (considering the location), but sometimes your stomach will applaud you. Konak – Give your navigation skills a rest! This popular eatery is right in Tünel Square, and is a neighbourhood hero when it comes to classic Turkish dishes. There’s a lot of meat on the menu: kebap and köfte options out of the ears! But this far more chic than other kebap places, and boasts many clean and lighted floors, and an English speaking staff that can give advice and recommendations. And desserts…künefe, baklava, sütloç, kazandibi…Not sure what it is? Get away from Google and go try them instead! Galata and especially Istiklal Avenue have recently become quite touristy and developed. A a general rule of thumb, places on the main street are more pricey, more flashy, and assure that you are paying for ambiance. Venturing of the busy drags, and you will surely be delighted with the amount of diverse, affordable, and interesting venues you can find. You can definitely find something for everyone’s taste if you’re willing to search for it, and you may even get lucky coming across some hidden gems on your explorations through the side-streets. The number of pubs and bars around here is immense, but here are some places we and our guests have enjoyed in the past. Perla Kallavi Nargile Café – This of course isn’t a bar or a pub per se, but rather a stellar place to smoke shisha. Unlike many nargile cafés, this place is not dolled up for tourists, but rather full of locals, and bustling with a lively atmosphere. Many flavours of shisha, many couches, reasonable prices, and plenty of drink choices (no alcohol though). Close to Istiklal Avenue, this place occupies the top could floors of an old apartment building, so it offers a wonderful panoramic view of the neighbourhood. This definitely a place to try, or at least observe, while in Istanbul. Ritim – A relaxed rock-themed bar with good priced beer and the option of sitting or on a number of spacey and dim floors inside, or dancing in the wild lights of the top floor. This place has friendly historical ties to World House Hostel, so ask a manager if you want to hear more about it! Ritim especially popular with backpackers and Erasmus students. Montreal – An (apparently) Canadian-themed bar that contains nothing even vaguely Canadian, except perhaps manners. Very lively and young place, with upbeat music streaming late into the night. Shots seem to be especially popular here, and drinking them is sometimes carried out in large (and potentially ridiculous) quantities – for example, 35 shots for 100 liras. Peyote – A very alternative-styled venue with a stream of experimental, grunge, or esoteric rock coming through. A big place for students and musicians. Interestingly, Peyote is also home to an alternative record label in Turkey. Connections, connections. Publico – Right down the street from World House is this new, vogue venue. Neon glows emanate out of this colourful and flashy venue and fill Tünel Square. Eyercatching, hypnotic. Enjoy a beer and a jive before continuing your trek down Istiklal. Pixie Underground – An alternative underground bar specializing in that wacky phenomenon known as dub step and that other phenomenon known as drum and bass. Small, personal, underground, with a surrealistic ambiance. Küçük Beyoğlu – A definite staff staff and guest favourite. This rock bar with a long history of opening and closing in various spots, has at last nuzzled itself into the hearts of countless students and beer-loving youths. It’s all in the character. One receptionist had something like this to say: “Even if the waiters weren’t so handsome, I think I would still go back. I’ve been going again and again since high school, and a tonne of regular customers that know this place like I do.” With an amiable space and staff, and many constant customers, you’ll soon be among friends! Thales – An easy-to-like rock bar tucked away behind the McDonalds on Istiklal. People have described their relationship with place in words similar to as if they were describing a preordained love. “Immediate,” “forever,” and “always interesting,” are sometimes used by people who discover Thales by chance. With a focus on specialty shots and beer-and-shot deals which change on a regular bases, this place will keep your palette interested, and make sure you leave “satisfied” again and again. Tektekçi – The name means something like “buy one get one.” One, as you may have guessed, is a shot. This is a very new, very cozy, mostly outdoor place with a stylish but quirky character to it. A cozy heating system, good drinks and close proximity guarantees you are warm and sociable all night long. Good for bustling together in the wintertime. Beers are served in a bottles that makes it look like milk (don’t ask us why), and there is a good selection of shots. Arsen Lupen – A somewhat hidden place off Istiklal, on the 5th floor above a classy café closer to Taksim Square. A dim and smooth atmosphere in a hip-antique hybrid space. Very popular with locals, and very rarely too packed. Good spot for a quieter evening conversation, or to enjoy live music and dancing at night. The sound of choice is usually more Middle Eastern or Gypsy inspired folk.